As we gear up for the holidays, I find myself increasingly aware of how many things I’m grateful for. The basic necessities of life are covered and I don’t need the “gifts” (though, please, I like them :). What I enjoy the most is spending time with friends and family. 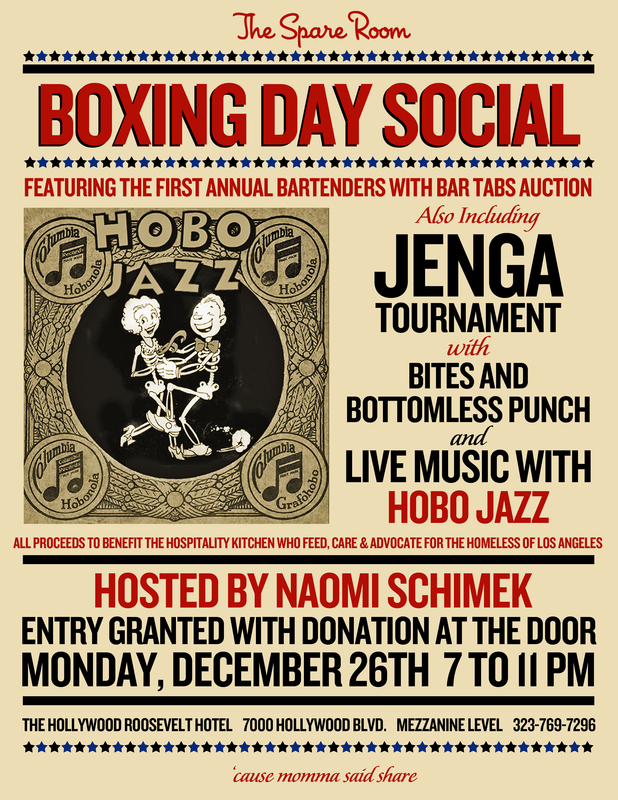 With a suggested $10 donation, Spare Room is featuring live jazz, a Jenga tourney, food and bottomless punch on Boxing Day, Monday, December 26th. There will also be the first annual Bartenders with Bar Tabs Auction. Spare Room Beverage Director Naomi Schimek says the city’s finest including Kate Grutman, Aidan Demarest, Marcos Tello, Dave Kupchinsky, Lacey Murillo, Lauren Osbourne, and more will be on the auction block. Winning bidders get paid drinking dates with these fine bartenders. The proceeds of the door and auction will be donated to Hospitality Kitchen. The event is from 7 to 11 PM. This entry was posted in bars, bartenders, cocktails, events, hot bartenders, la, la cocktails, los angeles, the minty and tagged aidan demarest, auction, bartenders with bar tabs auction, boxing day, charity, davekupchinsky, event, events, food, games, hollywood, hospitality kitchen, jenga, kate grutman, lacey murillo, lauren osbourne, live music, marcos tello, naomi schimek, punch, roosevelt hotel, spare room. Bookmark the permalink.